Sometimes I want comfort food, but I either don't have a lot of time or I'm just not in the mood to make a low and slow supper. 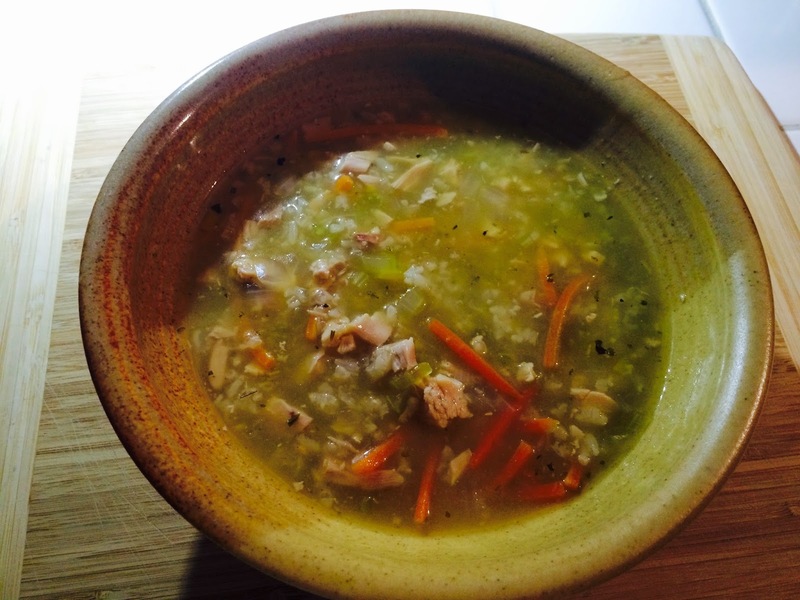 This soup is a great way to use up leftovers whether that be chicken, rice, or veggies that need to be used up. To make this meal even easier, buy a whole baked chicken from your local store. My favorite place to buy a whole baked chicken is Costco. They don't add a lot of foo-foo flavorings, and the cost is nearly the same as for a raw chicken. The first night we had sliced chicken with some veggies. After your meal, remove the meat from the bone. I also remove the skin to reduce fat. I'm always surprised how much meat there is on what looks like a fairly small chicken. I then go one step further after removing the meat. I separate some of the white meat and use it to make chicken salad for a few lunches. The rest of the white and dark goes into the soup. What's in your fridge? If you don't want to be surprised by forgotten food in your fridge, it's always good to go through it every 3 or 4 days and choose what needs to be eaten. Some of the best meals are made with leftovers. In my case, I had a small bowl of sticky rice and a half of a large onion that needed to get used. Add in a little celery, spices, and vegetable broth, and you have a savory meal that will warm you up even on the coldest of nights. Add broth to medium sized stock pot. Cut up onion, celery, and carrots. Add to broth. Add in bay leaf, pepper, salt, and Italian seasonings. Bring mixture to a boil and then add in chicken and rice. Reduce heat to simmer, put lid on pot, and set timer for 30 minutes to an hour. Remove bay leaf from soup.